The Internal Revenue Code requires employers to withhold social security and federal excise taxes from their employees' wages. [§§ 3402(a), 3102(a).] The employer holds these monies in trust for the United States.§ 7501(a) [here]. Accordingly, courts often refer to the withheld amounts as “trust fund taxes”; these monies exist for the exclusive use of the government, not the employer. Payment of these trust fund taxes is not excused merely because as a matter of sound business judgment, the money was paid to suppliers in order to keep the corporation operating as a going concern – the government cannot be made an unwilling partner in a floundering business. The Code assures compliance by the employer with its obligation to pay trust fund taxes by imposing personal liability on officers or agents of the employer responsible for the employer's decisions regarding withholding and payment of the taxes. Slodov v. United States, 436 U.S. 238 (1978). To that end, § 6672(a) [here] of the Code provides that “[a]ny person required to collect, truthfully account for, and pay over any tax . . . who willfully fails” to do so shall be personally liable for “a penalty equal to the total amount of the tax evaded, or not . . . paid over.” § 6672(a). Although labeled as a “penalty," § 6672 does not actually punish; rather, it brings to the government only the same amount to which it was entitled by way of the tax. Personal liability for a corporation's trust fund taxes extends to any person who (1) is "responsible" for collection and payment of those taxes, and (2) "willfully fail[s]" to see that the taxes are paid. In addition to the TFRP which is a civil liability only, Section 7202, here, imposes a parallel criminal penalty for those individuals who are responsible within the employer organization to attend to the withholding, accounting for and paying over. Failure to withhold, account for and pay over is a common phenomenon with businesses encountering cash flow difficulties. The person or persons within the organization who determine which creditors get paid rob Peter to pay Paul -- i.e., they divert the withheld tax [or deemed withheld] to other creditors (sometimes to themselves). In many, perhaps most of these cases, they intend only a temporary diversion -- hoping to keep the business afloat, steady the ship, and produce cash flow sufficient to pay the trust fund taxes and any penalties for delinquent reporting and payment. Sometimes (many times in the aggregate across the economy) the business goes under and the trust fund taxes are not paid. This sets up the potential for the TFRP and, in some of the more egregious cases, criminal liability under Section 7202. Tax practitioners deal frequently with clients who are facing IRS action or potential action against them individually for their employer's nonpayment of trust fund penalties. Often clients will say that the potential civil liability for the TFRP is bad enough, but they certainly don't like the risk of criminal prosecution. I have had clients ask me if I can illustrate when conduct crosses the line from civil TFRP liability only into potential criminal prosecution. 1. There is and will be no acknowledgment of filing following entry into the Streamlined procedures. The cashing of checks is not an indication that the IRS has accepted the certification of nonwillfulness. If the taxpayer desires closure, the OVDP program can be used. JAT comments: Of course, the OVDP requires income tax beyond years that would be open if the taxpayer is nonwillful and requires a higher offshore penalty for those joining OVDP after announcement of the Streamlined procedures, so the cost of getting closure through OVDP is pretty great. The taxpayer could opt out of OVDP and take an audit, in which case if the taxpayer is nonwillful, the opt out audit should produce a result perhaps even more beneficial than even the Streamlined result. But it will be a hassle. So, those wanting the benefit of Streamlined are probably better off to just do the Streamlined and just accept the uncertainties involved. 2. There is no benefit to requesting pre-clearance in OVDP and then pursuing the streamlined treatment. The notion apparently is that, if the taxpayer is non-willful, he does not need the placeholder benefit that pre-clearance might offer. JAT comments: My understanding was that practitioners were using the OVDP pre-clearance followed by streamlined to have an argument that they should get streamlined if some event occurred between the pre-clearance and the submission of the streamlined documents. But, if the taxpayer really is nonwillful, ultimately bad results would not obtain even with that interim event. And, if the taxpayer is willful, the bad result can still obtain anyway. Keneally also warned practitioners they could be sending the wrong message when they use pre-clearance for their clients when it isn't needed. "If there's a pre-clearance and then there isn't an OVDP filing, that's also saying something to the government," Keneally said. "If . . . there are treaty request responses that actually disclose those accounts, or there's a whistleblower, and that information comes forward, you're at least risking some investigation into why you tr[ied] the pre-clearance and then [did] not come in, because we have this mismatch," she said, adding that "it is not a free pass" to take such action. JAT comments: I am not sure that is inconsistent with the point in paragraph 2. I would think that the more immediate risk is that the IRS might use the pre-clearance with failed OVDP submission (nothing further done in OVDP) as a basis to do at least preliminary work for an audit. And, of course, the IRS could use information from other sources to start an audit. But, if the taxpayer is really nonwillful, an audit should not be feared, however, the IRS gets information. And, if the IRS gets information that indicates willfulness, then the taxpayer should have joined and completed the OVDP program. Cono R. Namorato is currently a Member of the law firm Caplin & Drysdale, a position he has held since 2006 and previously from 1978 to 2004. From 2004 to 2006, Mr. Namorato served as Acting Deputy Commissioner for certain designated matters and as Director of the Office of Professional Responsibility for the Internal Revenue Service (IRS) in the Department of the Treasury. Before beginning his career at Caplin & Drysdale, Mr. Namorato held various positions within the Tax Division of the Department of Justice (DOJ), including Deputy Assistant Attorney General from 1977 to 1978, Assistant Chief and then Chief of the Criminal Section from 1973 to 1977, and Supervisory Trial Attorney and Trial Attorney from 1968 to 1973. Mr. Namorato began his career in 1963 as a Special Agent for the Criminal Investigation Division of the IRS in the Brooklyn District. He is a Fellow of the American Bar Foundation and a fellow of the American College of Tax Counsel. Mr. Namorato has headed various tax-related committees and subcommittees for the American Bar Association, serving as Chair of the Tax Section’s Subcommittee on Criminal Tax Policy, Chair of the Committee on Tax Litigation, and Co-Chair of the Committee on Complex Criminal Litigation of the Litigation Section. Mr. Namorato received a B.B.A. from Iona College and a J.D. from Brooklyn Law School. JAT Comment: I have known Cono since my earliest days at DOJ Tax in 1969. Cono was in the Criminal Section. I was in the Appellate Section. Our Sections had offices adjacent to each other. Cono befriended me earlier and I always appreciated that. He is a class act. A superseding indictment has been filed in United States v. Berlinka, Frei & Keller (SDNY S 12 Cr. 02 (JSR)). For discussion of the original indictment, see New Swiss Enabler Indictments - Bankers Related to UBS and, Allegedly, Wegelin (Federal Tax Crimes Blog 1/3/12), here. The superseding indictment continues the original offense and defraud / Klein conspiracy charge and adds one charge each against the three defendants. One of the defendants, Keller, was recently arrested in Germany. See Wegelin Banker Arrested in Germany on U.S. Charges (Federal Tax Crimes Blog 2/6/15), here, so this apparently was the time to expand the scope of the indictment.. The additional charge against each defendant is the substantive crime of tax obstruction, Section 7212(a), here. The charge is under what is called Section 7212(a)'s Omnibus Clause. Tax obstruction has been called a one-person Klein conspiracy (which is also charged against each of the defendants). So, I thought I would discuss the new tax obstruction charge as it relates to the conspiracy charge. 138. From at least in or about 2002 up through and including in or about 2011, in the Southern District of New York and elsewhere, MICHAEL BERLINKA, URS FREI, and ROGER KELLER, the defendants, together with Wegelin, Managing Partner A, Executive A, Client Advisor A, Beda Singenberger, Gian Gisler, Clients A through JJ, and others known and unknown, willfully and knowingly did combine, conspire, confederate, and agree together and with each other to defraud the United States of America and an agency thereof, to wit, the IRS, and to commit offenses against the United States, to wit, violations of Title 26, United States Code, Sections 7206(1) and 7201. 139. It was a part and an object of the conspiracy that MICHAEL BERLINKA, URS FREI, and ROGER KELLER, the defendants, together with others known and unknown, willfully and knowingly would and did defraud the United States of America and the IRS for the purpose of impeding, impairing, obstructing, and defeating the lawful governmental functions of the IRS in the ascertainment, computation, assessment, and collection of revenue, to wit, federal income taxes. 140. It was further a part and an object of the conspiracy that various U.S. taxpayer-clients of MICHAEL BERLINKA, URS FREI, and ROGER KELLER, the defendants, together with others known and unknown, willfully and knowingly would and did make and subscribe returns, statements, and other documents, which contained and were verified by written declarations that they were made under the penalties of perjury, and which these U.S. taxpayer-clients, together with others known and unknown, did not believe to be true and correct as to every material matter, in violation of Title 26, United States Code, Section 7206(1). 141. It was further a part and an object of the conspiracy that MICHAEL BERLINKA, URS FREI, and ROGER KELLER, the defendants, together with others known and unknown, willfully and knowingly would and did attempt to evade and defeat a substantial part of the income tax due and owing to the United States by certain of Wegelin's U.S. taxpayer clients, in violation of Title 26, United States Code, Section 7201. U.S. District Judge James R. Spencer just sentenced Maureen McDonnell to a year and a day in prison — which is actually better news than if she had been sentenced to exactly a year. In the federal system, inmates with sentences longer than a year can get them reduced 54 days a year for good behavior. If McDonnell had received a sentence of a year or less, she would not have been eligible. One should not jump to the conclusion that Mrs. McDonnell will actually serve 366 days less 54 days (assuming as is usually the case in white collar crime cases, the defendant qualifies for the good time credit). Rather, the actual incarceration reduction in this case is 47 days. Why? Thus, at the end of the first year (Year 1) that prisoner would earn the statute's maximum credit of 54 days. The relevant official (whom we shall call the “good time calculator”) would note that fact and, in effect, preliminarily put the 54 days to the side. At the end of Year 2 the prisoner would earn an additional 54 days of good time credit. The good time calculator would add this 54 days to the first 54 days, note the provisional total of 108 days, and again put the 108 days' credit to the side. By the end of Year 8, the prisoner would have earned a total of 432 days of good time credit (8 years times 54 days). At that time, the good time calculator would note that the difference between the time remaining in the sentence (2 years, or 730 days) and the amount of accumulated good time credit (432 days) is less than 1 year (730 minus 432 equals 298 days, which is less than 365). The 432 days of good time credit that the prisoner has earned by the end of Year 8 are sufficient to wipe out all of the last year of the 10-year prison term and to shorten the prisoner's 9th year of imprisonment by 67 days. Year 9 of the sentence will consequently become the prisoner's last year of imprisonment. Further, because the prisoner has already earned 67 days of credit against that year (432 days already earned minus 365 days applied to Year 10 leaves 67 days to apply to Year 9), the prisoner will have no more than 298 days left to serve in Year 9. Now the good time calculator will have to work out just how much good time the prisoner can earn, and credit against, these remaining 298 days. As we said, the statute provides that “good time” for this “last year or portion” thereof shall be “prorated.” Thus, the good time calculator must divide the 298 days into two parts: (1) days that the prisoner will have to serve in prison, and (2) credit for good behavior the prisoner will earn during the days served in Year 9. In other words, the number of days to be served in Year 9 plus the number of good time credit days earned will be equal to the number of days left in the sentence, namely, 298. And to keep the award of credit in the last year proportional to awards in other years, the ratio of these two parts of Year 9 (i.e., the number of good time days, divided by the number of days served) must be 54 divided by 365, the same ratio that the BOP applies to full years served. We can use some elementary algebra, described in the Appendix, infra, to work out the rest. The result is that if the prisoner serves 260 days, he can earn an additional 38 days of credit for good behavior. That is to say, of the 298 days remaining in his sentence, the prisoner will have to serve 260 days in confinement, after which point, his sentence will be fully accounted for (given the additional 38 days' credit earned), and he will be released. In sum, a prisoner subject to a 10-year (3,650-day) sentence who earns the maximum number of days the statute permits will serve 3,180 days in confinement and receive 470 days of “good time” credit, about 15% of the prison time actually served. Thus, in order to achieve a full 54 day credit reduction for the first year, Mrs. McDonnell would have to serve 365 days. But, with the good time credit, she will not actually serve 365 days. Hence, her credit will have to be less, prorated based on her time actually served after the credit is considered. That requires some calculation, but the gurus who do this say that the good time credit is 47 days. Hence, she will have to serve 319 days (366 less 47 days). I have posted before the on federal good time credit. See particularly paragraph 1 in Another UBS Client Bites the Dust - One Year Sentence (Federal Tax Crimes Blog 9/17/10), here. Readers might be interested in a recent article -- Justin Thornton and Jay Nanavati, DOJ and IRS Use “Carrot ‘n Stick” to Enforce Global Tax Laws, 29 Criminal Justice 4 (2014), here. The authors are excellent lawyers and major players in in the offshore bank practice and provide a very good summary of developments up to the date of publication. Since being handed enforcement authority from the Financial Crimes Enforcement Network in 2003, the Service has begun a campaign to provide stricter enforcement of the long-neglected Report of Foreign Bank and Financial Accounts (FBAR), which requires disclosure of foreign financial assets through Form TD F 90-22.1. Willful violations were required for any penalty under the pre-2004 law and carry heavy penalties under existing law, so these enforcement efforts rely to a great extent on the interpretation of the willfulness provision. Williams and McBride were the first two cases to address the willfulness requirement for an FBAR civil penalty. In Williams, the court held that failing to file an FBAR after signing a tax return constitutes “a conscious effort to avoid learning” about the FBAR requirement, which satisfies the willfulness requirement. In McBride, the court held that signing a tax return constitutes knowledge of the duty to comply with FBAR, which satisfies the willfulness requirement. By holding that taxpayers willfully violate the FBAR statute simply by signing a tax return and then failing to file, both Williams and McBride construe the willfulness requirement more broadly than applicable precedent would have dictated. This Comment argues that the current text of the statute and precedent require a more narrow reading of the FBAR willfulness requirement. It argues that taxpayers should not be charged with constructive knowledge after signing a tax return. Instead, a court should have to find that the taxpayer is aware of the existence of the FBAR requirement in order to find a willful violation. In addition to being consistent with the text of the statute and precedent, this approach would avoid the liability nightmare created by a combination of the Williams–McBride strict liability standard and the ill-defined “other financial account” language in the law. The Williams–McBride interpretation of the willfulness requirement in 31 U.S.C. § 5321(a)(5) is flawed because it imposes a strict liability standard where both the statute and the case law indicate otherwise. Before addressing the ways this standard misapprehends precedent, it must be noted that this standard cannot possibly be applied to the current version of section 5321(a)(5). Under the pre-2004 version applicable in Williams and McBride, the civil penalty in section 5321(a)(5) could be assessed only for willful violations. But under the current version of section 5321(a)(5), there are separate penalties for non-willful violations. Using the Williams–McBride standard of willfulness, it is difficult to conceive of how a violation could be nonwillful. The solution for future courts is to look past the flawed Williams–McBride reasoning and adhere to the Sturman standard, which looked for an actual intent to violate the FBAR requirement or a course of conduct that would allow a court to infer willfulness. This would clearly avoid the liability problems created by the strict liability of Williams–McBride while upholding the relevant Supreme Court precedent and the current version of the statute. After taking considerable heat on which we reported before, the IRS has hunkered back to a policy that generally (that's a fuzz word) will allow seizure only where the IRS has proof of illegal income. So, under the new law, generally the innocents (meaning those without illegal income) can intentionally violate the structuring law without being subject forfeiture and presumably without being subject to structuring prosecution. It seems to me that Congress should change the law rather than have the IRS not enforce the law as Congress wrote it or to signal to citizens that they can violate the law with impunity so long as they do use illegal funds. Some changes to the law are now in consideration, hence the House Hearings, but I am not sure the proposals fix the fundamental problem. IRS Commissioner John Koskinen said February 11 that the agency changed its civil asset forfeiture policy last October because an internal review found that it was applied inconsistently, and it decided it won't pursue cases in which serial bank deposits are just under the $10,000 threshold for reporting under the Bank Secrecy Act of 1970 unless there are indications that the funds were illegally obtained. That deposit practice, called structuring, may be linked to organized crime, drug dealers, and terrorism, Koskinen told the House Ways and Means Oversight Subcommittee. In each forfeiture case, the IRS prepares a search warrant for review by the appropriate U.S. attorney's office, he said. The warrant must then be approved by a federal judge before a seizure can take place, he noted. The IRS conducted 146 civil asset forfeitures in fiscal 2014, accounting for about 5 percent of the workload of the IRS Criminal Investigation division, Koskinen said. The median value of assets seized was less than $34,000, Rep. Patrick Meehan, R-Pa., said, though the commissioner said the average is well over $100,000. In 60 percent of forfeitures, Koskinen added, no taxpayer challenged the IRS seizure, suggesting the depositor was probably involved in some illegal activity. "We came up with the decision that the right balance between law enforcement and trying to protect taxpayers was, when there was no evidence that the funds were from illegal sources, there would be no seizure," Koskinen said. The new policy has been communicated to IRS agents, and appropriate changes will be made to the Internal Revenue Manual by the end of the first quarter of 2015, he added. Following Koskinen's remarks, the subcommittee heard from angry small business owners who said their companies were hobbled or threatened with closure after the IRS seized their bank accounts claiming they had repeatedly made bank deposits of less than $10,000 to avoid reporting requirements under the Bank Secrecy Act. Investigators are looking into UBS’s use of so-called bearer securities, which can be redeemed by anyone holding the paper, making them a potential tool for hiding assets. Authorities are focusing on whether UBS issued the securities to clients or invested in them on their behalf, according to the person. Investigators suspect the conduct may have occurred when the bank was still bound by the deferred-prosecution agreement, which expired in October 2010, the person said, asking not to be identified because the inquiries aren’t public. If that’s true, the Justice Department could take the unusual step of reopening the accord and prosecuting the bank on the original conspiracy charge, according to lawyers including Michael Perino, a law professor at St. John’s University in New York. “If you’re violating the terms of a deferred-prosecution agreement, that means the government can go back on its decision not to prosecute you,” Perino said. Prosecutors also could file new charges against UBS and seek stiffer penalties and oversight at sentencing for violating the previous agreement, according to Brandon Garrett, a University of Virginia law professor who has written a book examining corporate prosecutions. “UBS has already settled three prosecution agreements since 2009,” Garrett said. “UBS is already a recidivist many times over,” he said. The government may decide to seek a conviction with probation supervision, he said. Popularized after the U.S. Civil War, bearer bonds were traditionally issued in paper form and were payable to whomever physically held them. Because they’re unregistered, they can be used to evade taxes or launder money, according to tax specialists including Stephen Land, a lawyer with Duval & Stachenfeld LLP. Rendered virtually illegal in the U.S. by tax regulations, they are still common investments in Europe, he said. If held in paper form, a bearer bond offers complete anonymity. “When you think of that kind of anonymity, you can understand why the government hates bearer bonds,” Land said. Bearer securities largely disappeared from the U.S. market following the 1982 budget law. U.S. restrictions tightened further within the past few years, making it impractical for U.S. companies to issue bearer bonds, Land said. U.S. investors also face strict regulations and tax consequences making the bonds unattractive, according to a 2012 client notice published by law firm Milbank Tweed Hadley & McCloy LLP. “A lot of people believe that the advantages would be mostly illicit” and “the legitimate advantages are few,” said Richard Painter, a corporate law professor at the University of Minnesota. While the bonds can be traded electronically, eliminating some of the secrecy benefits, they may still be treated as unregistered for the purposes of a financial institution’s internal procedures, tax experts said. Also those with access to Tax Notes Today might want to read Amy S. Elliott, UBS Discloses Bearer Bond Tax Evasion Investigation, 2015 TNT 29-2 (2/12/15) (no link available) for further or at leastl different detail. Finally, Professor Brandon Garrett is quoted. I posted a couple of days ago on Jed Rakoff's review of Professor Garrett's book: Judge Jed Rakoff Reviews Brandon Garrett's Book on Too Big to Jail: How Prosecutors Compromise with Corporations (Federal Tax Crimes Blog 2/10/15), here. The book is Too Big to Jail: How Prosecutors Compromise with Corporations (Belknap Press/Harvard University Press 2015), here. While establishing jurisdiction over HSBC Private Bank (Suisse) SA could allow UK authorities to pursue HSBC, they would still face a tougher challenge than U.S. peers in bringing a case against the bank rather than individuals. Tax lawyer Harry Travis said successful prosecutions against HSBC staff were more likely than against HSBC itself because under UK law, in order to convict a company of a crime, a prosecutor must usually show the highest levels of management were aware of wrongdoing and condoned it. "In U.S. law, you have a very different test, a much lower test. In the U.S., companies can be prosecuted for crimes committed for their benefit by their employees or their agents." At common law, breathless, lifeless corporations could not be charged with crimes. In N.Y. Cent. & Hudson River R.R. Co. v. United States, 212 US 481, 494 (1909), the Supreme Court held that corporations could be criminally liable for the acts of agents. see also United States v. Sun-Diamond Growers of Cal., 138 F3d 961, 970-71 (D.C. Cir. 1998), aff'd on other grounds, 526 US 398 (1999) (citing cases). For modern expansion of this concept to collective knowledge of the entity in the Bank Secrecy Act context, see United States v. Bank of New England, 821 F2d 844, 856 (1st Cir. 1987). Generally, if an agent acts within the scope of employment in a way that reflects some intent to benefit the organization, the organization may face criminal liability. One of the former Enron prosecutors summed it up nicely: “The legal rule is that if an agent of the organization committed a crime within the scope of employment, meaning basically while doing his job, and acted with even a partial intent to benefit the organization - in other words, not exclusively for self-interest, then the organization is criminally liable, full stop,” Samuel Buell quoted in Jonathan D. Glater and Lynnley Browning, Deal Likely to Let KPMG Avoid Charge in Tax Case, New York Times (8/11/05). Notwithstanding this general rule of criminal prosecution for corporations, corporations cannot be tried for some crimes. For example, general perjury (18 USC § 1621, here) requires a false statement under oath. Corporations cannot make statements under oath; people do. Accordingly, the corporation cannot be tried for perjury, but the corporate agent (officer or director) so testifying can be tried for perjury. 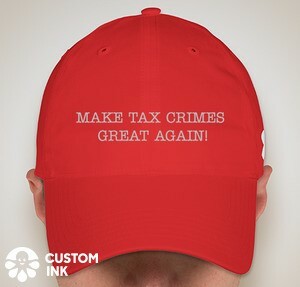 But, tax crimes enthusiasts should be aware that, somewhat inconsistently, a corporation can be charged and convicted for tax perjury, § 7206(1) because it permits conviction of a person which the Code defines in § 7701(a)(1) to include a corporation. See United States v. Ingredient Technology Corporation, 698 F2d 88 (2d Cir. 1984), cert. denied 462 US 1131 (1983) (Section 7206(1), here, tax perjury, prosecution). Here is an excerpt from the beginning of Judge Rakoff's review to whet your appetite to read the whole review and even the book. The Guardian reports on some of the fruits of a collaborative news effort by investigative journalists. David Leigh, James Ball, Juliette Garside and David Pegg, HSBC files show how Swiss bank helped clients dodge taxes and hide millions (The Guardian 2/8/15), here. • Routinely allowed clients to withdraw bricks of cash, often in foreign currencies of little use in Switzerland. • Aggressively marketed schemes likely to enable wealthy clients to avoid European taxes. • Colluded with some clients to conceal undeclared “black” accounts from their domestic tax authorities. The HSBC files, which cover the period 2005-2007, amount to the biggest banking leak in history, shedding light on some 30,000 accounts holding almost $120bn (£78bn) of assets. Although tax authorities around the world have had confidential access to the leaked files since 2010, the true nature of the Swiss bank’s misconduct has never been made public until now. Hollywood stars, shopkeepers, royalty and clothing merchants feature in the files along with the heirs to some of Europe’s biggest fortunes. The files show how HSBC in Switzerland keenly marketed tax avoidance strategies to its wealthy clients. The bank proactively contacted clients in 2005 to suggest ways to avoid a new tax levied on the Swiss savings accounts of EU citizens, a measure brought in through a treaty between Switzerland and the EU to tackle secret offshore accounts. The documents also show HSBC’s Swiss subsidiary providing banking services to relatives of dictators, people implicated in African corruption scandals, arms industry figures and others. Swiss banking rules have since 1998 required high levels of diligence on the accounts of politically connected figures, but the documents suggest that at the time HSBC happily provided banking services to such controversial individuals. The Guardian’s evidence of a pattern of misconduct at HSBC in Switzerland is supported by the outcome of recent court cases in the US and Europe. The bank was named in the US as a co-conspirator for handing over “bricks” of $100,000 a time to American surgeon Andrew Silva in Geneva, so that he could illegally post cash back to the US. Another US client, Sanjay Sethi, pleaded guilty in 2013 to cheating the US tax authorities. He was one of a group of convicted HSBC clients. The prosecution said an HSBC banker promised “the undeclared account would allow [his] assets to grow tax-free, and bank secrecy laws in Switzerland would allow Sethi to conceal the existence of the account”. In France, an HSBC manager, Nessim el-Maleh, was able to run a cash pipeline in which plastic bags full of currency from the sale of marijuana to immigrants in the Paris suburbs were collected. The cash was then taken round to HSBC’s respectable clients in the French capital. Bank accounts back in Switzerland were manipulated to reimburse the drug dealers. HSBC is already facing criminal investigations and charges in France, Belgium, the US and Argentina as a result of the leak of the files, but no legal action has been taken against it in Britain. Former tax inspector Richard Brooks tells BBC Panorama in a programme to be aired on Monday night: “I think they were a tax avoidance and tax evasion service. I think that’s what they were offering. Thanks to gottaloveUStax, a commenter, for the link to the article. Frankfurt prosecutors said they arrested a 50-year old Swiss citizen based on an international search alert by the U.S. seeking his extradition, Alexander Badle, a spokesman for the Frankfurt General Prosecutor’s Office, said in an e-mail. Keller was 47 when he was indicted three years ago. Berlinka [another Wegelin banker] began working at the bank in 2008, Frei [another Wegelin banker] started in 2006 and Keller began in 2007, according to a statement by U.S. Attorney Preet Bharara at the time. The men face as long as five years in prison if convicted. The indictment details how Berlinka, Frei and Keller allegedly helped 23 U.S. clients open undeclared accounts at their bank. Kenneth Heller, a disbarred New York maritime attorney who pleaded guilty to hiding more than $26.4 million in accounts at UBS and Wegelin, also is referred to in the indictment. The three bankers conspired with two other Swiss financial advisers already under indictment, Gian Gisler and Beda Singenberger, according to the charges. For prior coverage on Keller and the others, see New Swiss Enabler Indictments - Bankers Related to UBS and, Allegedly, Wegelin (Federal Tax Crimes Blog 1/3/12), here, and Wegelin Indicted in SDNY with Money Laundering Fofeiture (Federal Tax Crimes Blog 2/2/12), here. Prosecutors in the U.S. attorney’s office in Brooklyn are weighing evidence gathered with the Federal Bureau of Investigation to determine whether employees of the bank helped facilitate tax evasion or engaged in securities fraud, people familiar with the investigation said. Authorities are also trying to determine whether anyone at the bank engaged in criminal efforts to cover up the alleged conduct once it became more widely known about within the bank. UBS was recently served with a subpoena from authorities related to the matter, according to people familiar with the case. Prosecutors and FBI agents recently traveled to London to interview potential witnesses, the people said. UBS recently hired attorney John F. Savarese, [bio here] a partner at Wachtell, Lipton, Rosen & Katz, to conduct an internal investigation, according to the people familiar with the case. Such probes can cost banks millions of dollars in legal fees. Mr. Savarese didn’t respond to requests for comment. The alleged practices under scrutiny at UBS hark back to an old-fashioned type of tax evasion. At issue is the marketing of bearer securities as an investment to American clients, a financial tool whose use U.S. authorities largely ended because of its potential for abuse. Bearer securities were once popular because they were preferable to bulk cash payments, but a 1982 law imposed a variety of sanctions and tax penalties that made it very difficult to use or deposit such a certificate at a U.S. bank. Traditionally, bearer securities were issued in one of two ways. Bearer bonds, also known as coupon bonds, can be issued by banks as debt certificates in large denominations, sometimes millions of dollars each, that can be redeemed at certain banks by whoever possesses them. Some banks and other companies issue bearer shares, an equity share in a company, which is similarly owned by whoever holds it. Companies issuing bearer securities typically don’t register the securities’ owners or track transfers of ownership. Bearer securities can be a risky investment, because they are easily transferable and nearly anonymous, which means they can be stolen and cashed. For that reason, they have been used to cheat on taxes. By keeping an interest-bearing account or document with no ownership trail, and no forms filed to the IRS, the holder of such a certificate can hide assets and income from tax authorities. Today, bearer bonds can also be maintained strictly as an electronic account, generating a set rate of interest. It isn’t clear when the alleged conduct in the UBS matter is purported to have begun. Investigators believe some potential misdeeds occurred after the expiration of bank’s 2009 agreement with the Justice Department, which resolved its previous tax-evasion case and put off any related prosecution as long as the bank didn’t get into additional trouble in the following 18 months. The people familiar with the current probe said authorities don’t believe the new issues constitute a violation of the terms of that settlement. UBS’s woes stem from more than simply potentially marketing such investments to American clients or managing them, according to people familiar with the investigation. At one point, these people said, bank employees allegedly discussed how to deal with the potential legal problems of such transactions, and how they might hide them from authorities. For that reason, investigators are trying to determine the exact nature of those alleged discussions and whether they amounted to a criminal effort to conceal what had allegedly already been done. Long-time readers of this blog know what I think of Swiss banks. Not all of them, but some of them (UBS easily fits in the category). UBS may be said to give Swiss banks a bad name. There is probably some truth in that. But, like all hyperbole, it is ... , well, hyperbole. In United States v. Bailey, 2015 U.S. App. LEXIS 1681 (3d Cir. 2015) (nonprecedential), here, the Third Circuit affirmed the convictions of two persons -- Bailey and Haddow -- for conspiring to defraud the United States [Klein conspiracy] and to evade the U.S. Virgin Islands of taxes [offense conspiracy]. As described in the opinion, the principal scheme appears to be just garden variety enabler tax fraud. The defendants were principals in a Virgin Islands company that billed U.S. taxpayers for "services" never rendered and then, after the customers paid, returned most of the amounts to the taxpayers. The U.S. taxpayers deducted the payments for "services" and treated the amounts returned as "gifts." The defraud conspiracy charged related to this conduct. The VI company also claimed certain tax credits against it VI tax liability that it was not entitled to. The offense conspiracy charge related to this conduct. (1) two or more people agreed to defraud the United States; (2) the defendant became a member of that agreement; (3) the defendant joined the agreement knowing its purpose was to defraud the United States and intended to achieve that goal; and (4) a conspirator committed an overt act in furtherance of the objective. By contrast, the offense conspiracy charge to evade VI tax, does require that the defendant act willfully because the offense conspiracy imports the willfulness requirement from the offense (here tax evasion) that is the object of the conspiracy. The Court's treatment of these issues is very cursory, but (at least in its mind) sufficient to show the defendants had the required mental state. 3. The Court next rejected the defendants' claim that the 5-year statute of limitations normally applying to conspiracies under Title 18 Section 371 applied to the conspiracies they were charged with. The key word in the foregoing sentence is normally, suggesting there might be an exception. There is -- a six year statute of limitations for conspiracies related to conspiracies related to tax crimes. See . § 6531(1) & (8), here. The ABA Tax Section Meeting was in Houston this past weekend. I attended some of the many, many sessions. I offer here what I learned from the meetings I attended, supplemented by an article in TNT today: Andrew Velarde, No Letters of Intent Allowed Before Entering Streamlined Program, 2015 TNT 22-7 (2/3/2015) (no link available). 1. The IRS will not offer for the streamlined programs any analog to preclearance that is offered in the full-blown OVDP. Taxpayers thus, theoretically, are at risk until they make the submissions required by the streamlined programs. 3. The flagging of streamlined cases with at least 5 foreign information returns. The IRS representative "said the initial examination referred to in the IRM is more for completeness and coherence, labeling it a 'sanity check.'" See New IRS Internal Guidance on Processing Streamlined Submissions (Federal Tax Crimes Blog 8/29/14; 8/30/14), here. 4. Practitioners complained and the IRS acknowledged its awareness of the long delays for some long-time foreign residents without Social Security Numbers (SSNs). The problem is that those taxpayers, often prime candidates for the streamlined solution, cannot pursue the solution until they get SSNs, but have significant difficulty and time delays in getting SSNs. This is a recurring theme: Report on ABA Criminal Tax Fraud and Tax Controversy Conference (Federal Tax Crimes Blog 12/18/14), here. There is no solution in sight, but the IRS says it is continuing its discussions with the Social Security Administration. The taxpayers' concerns are related to the phenomenon noted above in paragraph 1 that there is no preclearance procedure to give taxpayers some assurance that, despite delays not of their making, they may not be able to complete the submissions until after these difficulties and long delays. 5. The IRS representative said that the IRS will not issue additional guidance on the meaning of willfulness in the streamlined program. But decades of shady banking practices and the country’s initial reluctance to end banking secrecy after the 2009 financial crisis have left their mark on the country’s reputation. It is not always easy to convince others of Switzerland’s good intentions, says Jacques de Watteville, State Secretary for International Financial Matters, and the man in charge of Swiss efforts in the area. Jacques de Watteville: All the criteria Switzerland fought for were accepted and included in the new rules which around 100 countries have agreed to adopt. The automatic exchange of information should apply to everyone in the same manner on the basis of reciprocity. Information can only be exchanged for clearly defined purposes and will be subject to data protection. Finally, transparency will apply equally to trusts and other legal entities. Another important element is that all the main financial centres have agreed to put the automatic exchange of information into practice. So, we can now fight on equal terms with Luxembourg, Austria, Singapore, Hong Kong or Jersey. The list of “non-cooperative” countries is being considerably reduced. There are still a few shady areas, but they will not be able to resist the current developments. J.d-W.: Everybody has been surprised by the speed of these changes. Two years ago nobody thought we would be here today, including those in the OECD (Organisation for Economic Co-operation and Development). There has been very strong momentum in favour of this major development. The crisis of 2009 reinforced international cooperation in fighting tax evasion and marked a real turning point. That year, Switzerland first decided to provide administrative assistance - not only in cases of fraud but also for tax evasion - and then we developed a strategy designed to ensure Swiss banks only held declared funds. Following that, rejection by the German parliament of the ‘Rubik’ accord on taxation between Switzerland and Germany coincided with the international push for the automatic exchange of information. To avoid being marginalised and subjected to increased pressure, and to maintain our competitiveness, we had to take on these measures at the same time as the others. But the attitude of the Swiss banks was also decisive. Whereas previously they had done everything to stop it, they subsequently came out in favour of the automatic exchange of information and invested a lot of resources in lobbying for it. And so forth. See the article for the rest of the interview. According to court documents, Fogel, a U.S. citizen, maintained an undeclared bank account held in the name of a foreign corporation at the Luxembourg branch of Bank Leumi. The undeclared foreign bank account and foreign corporation were set up with the assistance of David Kalai, a tax return preparer who owned United Revenue Service (URS). In December 2014, David Kalai and his son, Nadav Kalai, were convicted in the Central District of California of conspiracy to defraud the United States for helping certain URS clients set up foreign corporations and undeclared bank accounts to evade U.S. income taxes and for willfully failing to file FBARS for an undeclared foreign account that they controlled. According to court documents and evidence introduced at the trial of David and Nadav Kalai, Fogel was a doctor who operated several managed health care businesses. David Kalai suggested to Fogel that he could reduce his taxes by transferring money to a foreign bank account held in the name of a foreign corporation. David Kalai advised Fogel to open up the bank account that was set up in the name of a British Virgin Islands corporation. At a meeting facilitated and attended by David Kalai at the Beverly Hills branch of Bank Leumi, Fogel executed documents to open his Luxembourg bank account at Bank Leumi. According to court documents, Fogel diverted at least $8 million to his undeclared bank account at Bank Leumi’s branch in Luxembourg. Fogel has agreed to pay a civil penalty in the amount of approximately $4.2 million to resolve his civil liability with the IRS for failing to file FBARs. Fogel faces a statutory maximum sentence of five years in prison and a maximum fine of $250,000 or twice the gross gain or loss to any person, whichever is greater.